Do We Really Need A Poltergeist Reboot? This is part of what I hate about Hollywood. With the Poltergeist reboot trailer about to drop any day now, I wonder why anyone is remaking a movie that doesn’t particularly need it. Tobe Hooper’s (or Steven Spielberg’s, depending upon whom you ask) haunted house thriller is not only one of the better movies it its type, but its aged pretty well too. Then there’s the person that was chosen to direct: Gil Kenan. So far he’s done two films, Monster House and City Of Ember, neither of which in my eyes making him a good choice for the reboot (despite obvious parallels to Poltergeist and Monster House). There are SO many bad movies that would warrant a reboot, yet for some reason they start with the (potential) ruining of a classic. Posted in directors, horror, MGM, Movies, My Two Cents, Sony, upcoming.Tagged City Of Ember, Gil Keenan, Monster House, poltergeist, Steven Spielberg, Tobe Hooper. 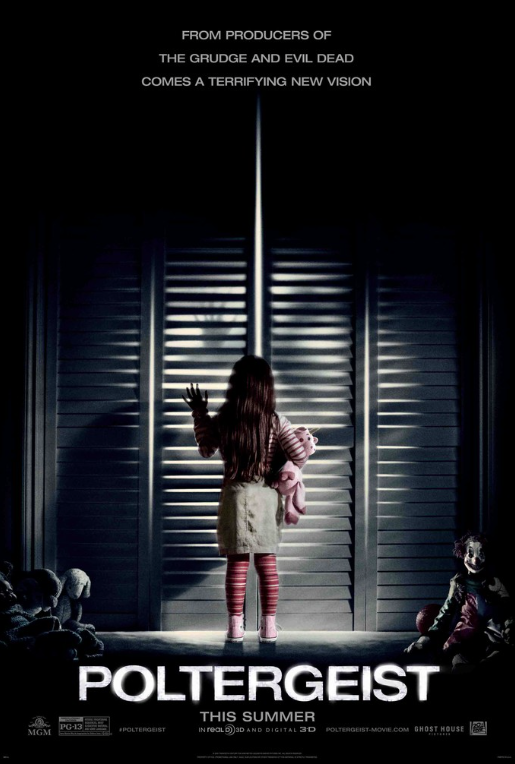 Although I don’t really agree that “Poltergeist” still holds up today, it is a classic horror film in my mind. I wrote about my experience with it at harrclin.wordpress.com if you’re interested. I titled it “The TV People”. I HATE it when Hollywood attempts a reboot of successful films. Where’s the creativity? Instead of remaking your favorite movie, re watch it, get inspired, and write your own horror movie. You’re speaking to the converted. And as to how well Poltergeist holds up I primarily meant that there’s nothing that happens–visually or production design-wise–that links the movie heavily to a particular time period. Agreed. Some of the spectacle screams 1982, however, it was AWESOME in 1982. I just remembered, if you can catch The Apparition, starring Sebastian Stan, do so. The reason I mention it is that it takes place in a similar setting as Poltergeist, and other than the ways people dress and vehicles, you couldn’t necessarily place when it time it takes place. Poltergeist is in some ways similar in its visual timelessness. Nice! I will totally check that one out! Thank you! I typacially dislike reboots on movies but when they did it with Carrie in 2013 I was utterly surprised i enjoyed it, so it could be great.